In this altar I have used the traditional elements of the Festival of Pure Brightness. My father took a picture of me and my family at a Ching Ming meeting in Honolulu years ago. While at this particular event, I couldn't resist photographing the juxtaposing humor of the burning barrel where we burned hell money and fire crackers expediting it all to heaven to our ancestors with the residue of VP motorcycle racing fuel. 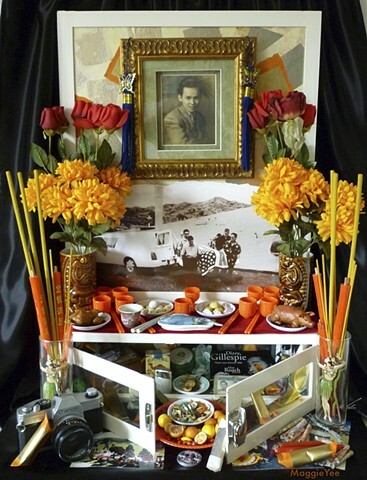 On a Dia de Los Muertos altar one will find the deceased favorite items. A medicine cabinet with a comparable compartments to his serves as an untraditional altar. The cabinet frames the image of my father as a young man and the very last time I saw him. It also conveniently holds his favorite and personal effects, his music and his vices. The camera was his amateur hobby. My siblings and I offered him to move to the mainland several times and each time he refused. He loved Honolulu. He walked everywhere in that city and photographed it repeatedly throughout many, many years. Looking at his photos, I saw Honolulu change through his eyes from the 70's to two months before his passing in April 2004. I included tiki mugs and hula girls on high ball glasses to honor his favorite pastime in the various Honolulu lounges. Cheers Dad!!! The Festival of Pure Brightness is based on tradition practiced in Hawaii by Chinese immigrants, who made their journey to Hawaii over 130 years ago. Dia de Los Muertos and Ching Ming have some similarities, although Ching Ming is held the whole month of April. An agreed day in April would be chosen to meet at the cemetery. Generations and extended families would come with traditional offerings of food. A roast pork represents earth, fish the sea, and chicken the heavens. A portion would be placed on a very low altar over the grave of the deceased, along with small cups of tea and their favorite liquor. Other food like dim sum, sweet buns, oranges and tea are consumed at the grave site picnic style among family members. Ritual items include incense, fresh flowers and decorative ornaments. Ceremonial offerings such as imitation money embellished with gold or silver foil, folded in the shapes of boats, along with hell money, are burned at the end of the ritual. The more money burned, the better for ancestral spirits to buy services or merits in the spiritual world. Firecrackers end the visit to ward off evil spirits lurking around the cemetery. In Hawaii, Ching Ming is a memorial for ancestors, bringing several generations together, and teaching children the rituals of honoring their ancestors.